Carnegie Worldwide, Inc. is a global growth management and retained cross-border executive search firm with a very special approach to their projects. 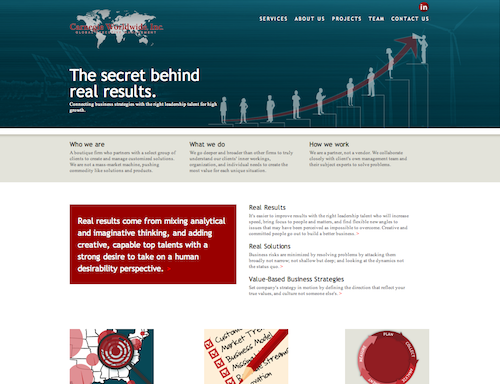 Having been part of this unique methodology as an independent consultant of CWW's, I am thrilled and honored to be working with them on the redesign of their website. I'll admit I'm having a lot of fun coming up with graphics that reflect their services and philosophy. Once I am almost finished with the graphic and layout of the site, I look forward to joining the team and proofing the copy - which is so crucial to the work that CWW does. This site will continue to evolve as we have many ambitious plans for interacting with clients and industry professionals.